Student debt levels are projected to rise to £25,000 for those starting university this year, research suggests. The annual survey of 2,000 UK students for university guide Push also found average yearly debt had increased by 5.4% to £5,600 per year of study. The figures come as Lord Browne prepares his review of student fees and finance for the government. Ministers say any changes to the system will take account of debt levels. Pressure on places is likely to be more intense than ever ahead of the new academic year. Many university courses are already full and with record numbers of people applying, some students may have to settle for courses and universities they would not otherwise choose. The researchers asked 2,000 students at 139 university campuses what debts they had amassed. They were asked to include everything from tuition fees to credit card and bank debts, but to exclude mortgages. 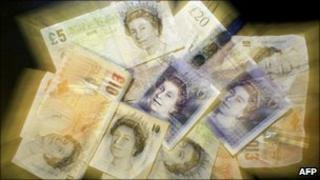 They found students in England had an average debt of £5,293 per year, while those in Wales netted an average of £6,411. In Northern Ireland it was £3,769. In Scotland, where UK students pay a lower fee but tend to study for four years, the average was £2,637. The UK average is then multiplied by the average number of course years and a number of inflationary factors are worked in to form a projection. Push.co.uk editor Johnny Rich said: "We are at a crunch point for student debt. Many talented potential students may shy away when they hear a degree will cost £25,000." He said that teenagers were already being put off from studying at university, and those from poorer backgrounds were most likely to miss out. "The higher the cost gets, the more people will be put off," he added. Aaron Porter, president of the National Union of Students, said it was vital that a fairer alternative is found to the deeply unpopular and regressive system of top-up fees. "Fees trebled three years ago, with no subsequent improvement in student satisfaction, and yet vice-chancellors now wish to more than double them again. Under current rules, students can claim a loan to cover the cost of tuition fees, plus extra for living costs. There are also grants for the poorest students. Lord Browne's review of student fees is set to report in the autumn. And the coalition government has said any policy changes resulting from the report will take account of student debt. A spokesman for the Department for Business, Innovation and Skills said: "A university degree is a very good investment in your future and it must be right that those who benefit contribute to the cost of their education. It added that it was committed to increasing social mobility and widening participation in higher education.